Thanks, as always, goes to The Broke and the Bookish for hosting such a fabulous feature every week. In light of the New Year, everyone has their list of goals and resolutions. Here are my bookish goals for 2013, which were quite fun to think of and come up with ... Please share your own goals in comments, I'd love to hear from you. 1. Read 200 books. I've completed this goal for the previous two years so I feel confident that I shall do the same in 2013. 2. Slow down book purchases so that I can make a bigger dent in my actual TBR pile. I'd really love it if I were able this year to read the vast majority of books that I've had for years and have never read. If that number came down from its current 150+ to something more like 30, I'd be incredibly happy. 3. Complete the British Books Challenge. The BBC, being hosted this year by Sarah at Feeling Fictional, is the only reading challenge that I have signed up for this year. I love reading and supporting books by British authors. 4. Further to the British Books Challenge, I would like to read between 66-100 books by British authors so that, on average, every 1 in 3 or 1 in 2 books I read is by a British author. 5. 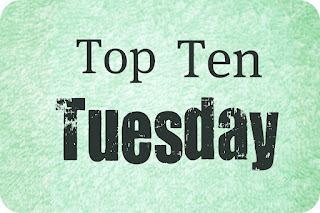 Read the Books that I resolved to read in last week's Top Ten Tuesday post. 6. Go to more author events and book blogger meet-ups. Bookish events are the highlights of my year. It'd be great to meet up more often with other book bloggers. This may mean organising things outside of publisher events. I'm quite happy to do that though. 7. Continue with my Family Book Club and inspire my two boys to be as excited about books as I am. As a family, we've read many books together. In the not so distant future, I will actually type up our thoughts on these books! 8. This has nothing to do with my blog, but I'm still studying for my degree in Psychology and I would very much like to be organised with my course this year so that I get the best marks possible. 9. Be more varied in what books I read. I'd like to read more from the library, reread some of my favourite books that I wouldn't normally feel like I had 'time for.' I'd like to read more adult books, or non-fiction, something different from all YA all the time. I'd also like to read backlist titles and not just the brand new releases that I get sent for review. 10. Enjoy reading. I often go through reading slumps or blogger burnouts, and I'd like to do whatever I can not to let either occur with any great regularity this year! What are some of your bookish goals in 2013? This is a great list - good luck with fulfilling all your reading goals! Reading more books by British authors is a good one and I meant to include that on My TTT but forgot! I'd love to get involved with blogger meet-ups too - how do you find out about them? Usually I'm invited to blogger brunches or events held by publishing houses and then bloggers will meet up before or after. Or other bookish events, like book launches and that sort of thing! Other times a blogger I've followed has organised her own meet-ups and invited all of her blogger followers in the area. I'm sure we're all drowning in unread books! I think my goal from now until forever will be to read more of my own books! Definitely agree about more author and blogger events! I absolutely live for them! Reading more books by British authors is definitely something I want to push myself into doing this year, because there are so many fantastic authors I'm missing out on! Good luck with your goals! I really want to go to some author signings, too! I went to my first in 2012 and really enjoyed it and I'd love to do it again! The only problem is that I'm really bad at finding this sort of stuff out! 200 books is a lot! I'm aiming for 100 and am already feeling like I'm behind even though I know that I'm being silly! I'm also doing BBC 2013 so I'm looking forward to seeing your progress! I love the family book club :D All the best to your 2013 resolutions! Hi, love your name :) And thank you. Author signings are really cool, is there a larger city nearby? I've only been to a few events, but the've always been fun! Good luck with your goals!